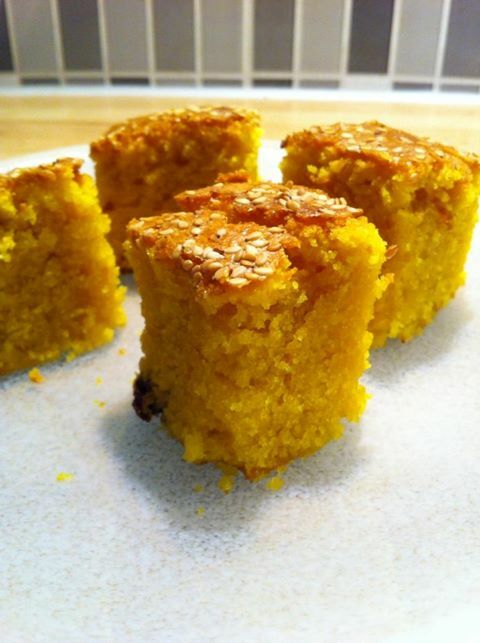 Sfoof is an Arabic cake with their appearance and flavor make one very happy, it lights up like the sun. Appealing to them most because it is not typical sweet as other Arab pastries are happy and contains no rosewater or orange blossom water that may not appeal to everyone. Turmeric adds not much flavor but with its color becomes cake absolutely stunning! It contains the nor any eggs, so those who are allergic have no problem eating it. Mix all ingredients except tahinin and sesame seeds. Brush shape with Tahini in a baking pan. Pour the batter in the pan and sprinkle with sesame seeds. Bake at 200 C for about 30 minutes.